Bees in the German state of Baden-Württemburg are dying by the hundreds of thousands. 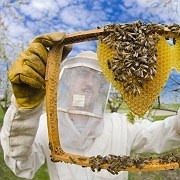 In some places more than half of hives have perished. Government officials say the causes are unclear -- but beekeepers are blaming new pesticides. In Germany's bucolic Baden-Württemburg region, there is a curious silence this week. All up and down the Rhine river, farm fields usually buzzing with bees are quiet. Beginning late last week, helpless beekeepers could only watch as their hives were hit by an unprecedented die-off. Many say one of Germany's biggest chemical companies is to blame. In some parts of the region, hundreds of bees per hive have been dying each day. "It's an absolute bee emergency," Manfred Hederer, president of the German Professional Beekeeper's Association, told SPIEGEL ONLINE. "Fifty to 60 percent of the bees have died on average, and some beekeepers have lost all their hives." The crisis hit its peak last weekend. Beekeepers from Germany's Baden-Württemburg reported hives full of thousands of dead bees. The worst-hit region, according to state officials, was along the upper Rhine river between the towns of Rastatt and Lorrach. The Rhine valley is one of Germany's prime agricultural regions. Regional officials spent the week testing bees, pollen, honey and plant materials to look for the die-off's causes. The Julius Kühn Institute in Braunschweig, a federal research institute dealing with agricultural issues, set up a special hotline for beekeepers to send in dead bees for analysis. But on Friday, Baden-Württemburg Agriculture Minister Peter Hauk said scientists still weren't sure what was behind the disaster. "As long as the causes are still unclear, we must consider all the possible ways we can reduce the risks for the bees," Hauk said. Hauk encouraged beekeepers to move their hives outside the affected area to prevent further damage. Meanwhile, Germany's beekeepers were pointing fingers at one of Germany's largest companies, blaming a popular, recently-introduced pesticide called clothianidin for the recent die-off. Produced by Monheim-based Bayer CropScience, a subsidiary of German chemical giant Bayer AG, clothianidin is sold in Europe under the trade name Poncho. It's designed to attack the nervous systems of insects "like nerve gas," says Hederer. The chemical was used last year to fight an outbreak of corn rootworm, and its success against the pest led to a much wider application this spring up and down the Rhine. But clothianidin is not a particularly selective poison. According to the US Environmental Protection Agency's fact sheet on the pesticide, "clothianidin is highly toxic to honey bees." Seeds are treated with the clothianidin in advance or sprayed with it while in the field, and the insecticide can blow onto other crops as well. The chemical is often sprayed on corn fields during the spring planting to create a sort of protective film on cornfields. Beekeepers say it's no coincidence that the bee die-off began at the beginning of May, right when corn planting started. "It's the pesticides' fault, one hundred percent," Baden Beekeeper Association chairman Ekkehard Hülsmann told the Bädische Zeitung newspaper. The circumstantial evidence is piling up. Beekeepers and agricultural officials in Italy, France and Holland all noticed similar phenomena in their fields when planting began a few weeks ago. French beekeepers recently protested the use of clothianidin in the Alsace region, just across the Rhine from Baden-Württemburg. 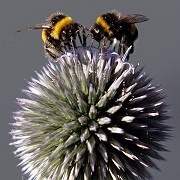 Hederer said German officials have been ignoring the damage pesticides do to bee populations for years. "The people who work in government agencies are all in the pockets of manufacturers," he said. Beekeepers are fed up, he says: "We've decided that keeping bees is more important than keeping our mouths shut." Nonetheless, government officials say the early results aren't conclusive. "The bees that were tested showed a buildup of [clothianidin] … but in such small amounts that the scientists couldn't say it was definitely the cause," the Baden-Württemburg Agriculture Ministry said in a statement on Friday. "The expert commission will continue its urgent investigation." Hauk said the ministry was developing new guidelines for farmers using clothianidin to reduce the amount bees were exposed to. As intensive agriculture becomes more and more common in Germany, the country's insects are beginning to suffer. Like the proverbial canary in the coal mine, bees are a prime indicator of the environment's health. The consequences could be dire -- bees pollinate 80 percent of German crops, from apples to rapeseed. A total bee collapse could cost German farmers billions of euro. The latest die-off is hitting a bee population already battered by a particularly long, wet and cold winter. Infestations of bee parasites like the varroa mite have also taken a heavy toll on bees in the past few years. Germany's bees are still in better shape than those in the United States, where the mysterious "Colony Collapse Disorder," or CCD, has devastated the American beekeeping industry. "Bees in the US -- with its huge farms -- get a lot more attention than Germany, with its little fields the size of handkerchiefs," Hederer says. "It's sad, but true: There always has to be a huge catastrophe before people start to use their brains." This page contains a single entry by Toni published on May 9, 2008 4:07 PM. Cell Phone Spying: Is Your Life Being Monitored? was the previous entry in this blog. Bush Administration Sued for Allowing Continued Use of Four Pesticides is the next entry in this blog.